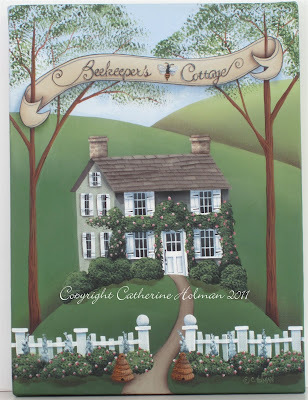 Recently a customer suggested that I paint a beekeeper's cottage. I have been painting for over 30 years and there are days that I fear my ideas will run dry and I'll wake up and stare blankly at my canvas. Thankfully between my imagination and wonderful ideas from my customers, that's not happened. 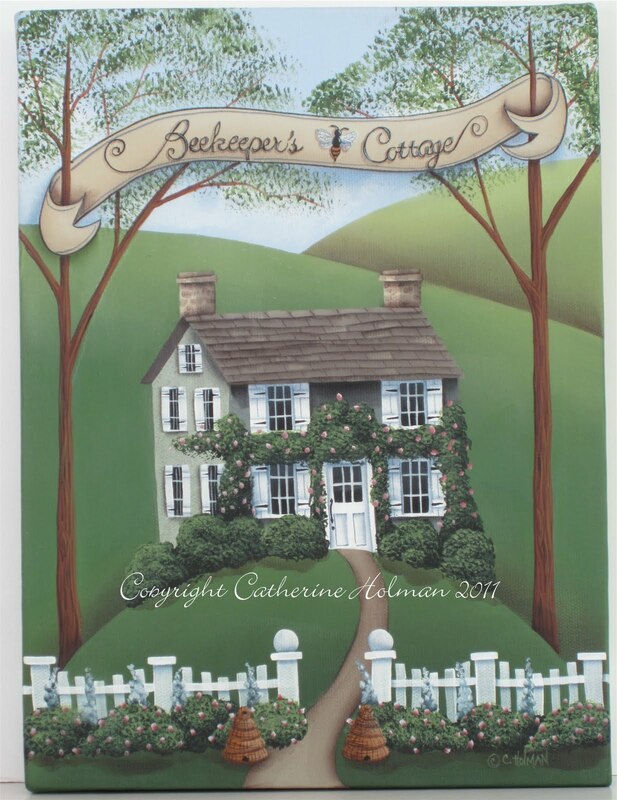 I've listed "Beekeeper's Cottage" on eBay. Iris and Floyd live in the Beekeeper's Cottage at the top of the hill in the charming village of Asbury. Floyd loves the buzz of the bees as he observes his hives and extracts the honey. Iris stocks the pantry with the liquid gold and stands back to admire the handmade labels she applied to the jars that morning. The jars are topped with red and white polka dot fabric tied on with jute. Thoughts of her "Honey", Floyd, and the many bee stings she has applied salve to over the years puts a smile on her face and love in her heart! I'm a collector of ideas, peoples names, village names, etc. and I keep them in a little notebook. Don't be shy if you'd like to share something to add to my little book of imaginary places and the people who live there. I would like to thank all the readers and customers out there who have freely shared in the past. I'm truly grateful! I love it; it is adorable!! Catherine, this painting is fabulous, just love it. Love the hives by the entry to the yard. I don't think you will ever run out of ideas. I think as artists, we are constantly inspired and just have a multitude of ideas rolling around our heads...thanks goodness, I don't think it will ever end. cathy - so lovely! I love the touch of the bee hives at the gate entrance in your painting. And of course your charming stories to go w/ it only adds to the beauty!! Cathie, how adorable!! I love it!! Your stories always make me smile. I just love them. This is a dear little painting. 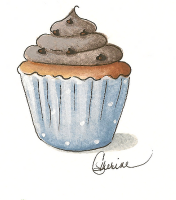 Cathie, this one is so cute and I love your story. 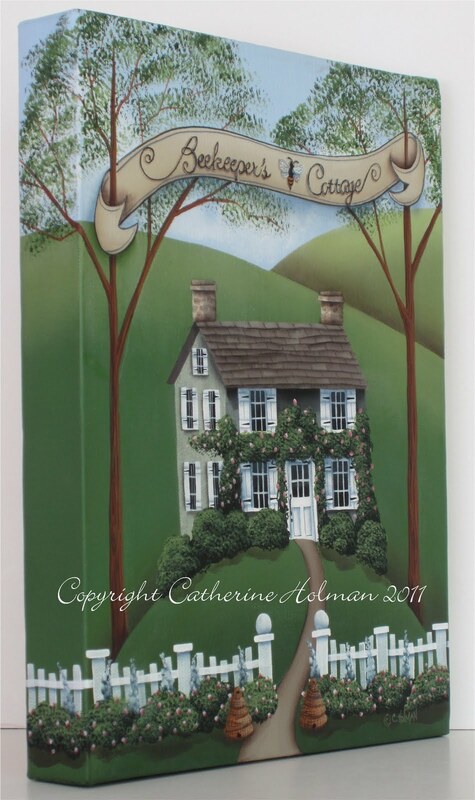 Hi Catherine: did you ever paint that little table that you bought at your neighbours garage sale. Your post of Feb. I'm so interested in this chalk paint need to check this out a little more. Thanks for that link to Miss Mustard Seed.